that may be coming to Branson this year for vacation. I wish to extend an invitation to any and all of my previous class members or friends that may be coming to Branson while we are here. 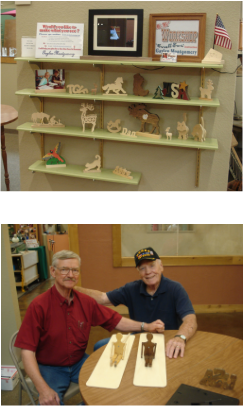 The time here, doing my Scroll Saw Workshops, has been very interesting and productive. Over (470) people from (37) states have taken advantage of the opportunity that I am offering. Participants have been from; Arkansas, Florida, Georgia, Illinois, Iowa, Kansas, Kentucky, Louisiana, Michigan, Minnesota, Missouri, Nebraska, Nevada, New York, Oklahoma, Pennsylvania, Texas, Utah, Virginia, West Virginia, Wisconsin, and more. It is very enjoyable to share this skill with so many people from all areas of our great country. Please check over the map on this link to allow you to see where the Branson Mill Craft Village is and how to find it. Branson is a great place to enjoy your vacation, and this is the easiest way to find us. 1. South on Hwy 65 from Springfield take the 248 exit, turn right. 2. Go west to the 2nd light and go straight through it onto Gretna Rd. 3. Go straight ahead about 1 mile, on left side, for the Branson Mill. The Contact Us page will get you directly to my e-mail.